You may recall that my last attempt at making jam in the bread maker didn’t set up. (That was some delicious syrup, though!) Now it’s May, and my fridge was overflowing with berries, so I thought it was time to give jam another chance. I could have made more freezer jam, but Greg expressed a strong preference for the taste and texture of the cooked jam, and so I went looking for a better bread machine jam recipe. Pectin! (I know. Obvious right?) Specifically, low – or – no – sugar pectin. When you’re making jam in the bread machine, you have to be careful not to put too much in the bread pan, or you’re going to be cleaning baked-on jam out of the heating elements. 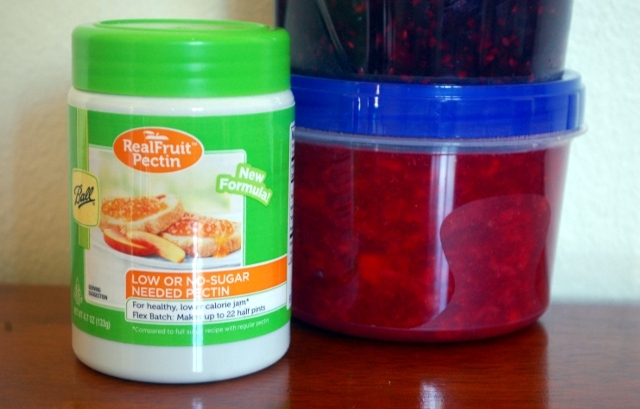 The low-sugar pectin allows you to put a lot less sugar in your jam and still have it set up marvelously. Add pectin, lemon juice, and sugar; stir together. Pour mixture into bread pan, place in bread machine and select jam cycle. When cycle finishes, remove pan from bread maker and allow to cool before pouring into clean containers. Store jam in the fridge (3 months) or the freezer (12 months). I made blackberry, then a mix of blackberry, raspberry, and strawberry, and then I made a lot of strawberry jam. Because this recipe uses so much less sugar, the jam is less sweet than “normal.” Some people were startled and not altogether pleased by this. Other people thought the stronger taste of fruit was really nice. The downside to this recipe is that it only uses one pound of fruit at a time, and (because you add so little sugar) it only makes 2 to 2 1/2 cups of jam each time. That’s not mentioning the fact that each jam cycle takes an hour and you must wash the bread pan in between each batch. By the time I’d finished three batches of jam I was pretty tired, and I decided to go nuts and see if the recipe would double well. My bread machine has a 2-lb-loaf capacity (so don’t go trying this if yours will only hold one pound) and it worked perfectly. I just doubled the recipe and stuck it in on the jam cycle, and nothing overboiled and the jam still set. So, if you have a larger amount of fruit to go through and you want to do it in the bread maker, you may want to do it two pounds at a time. 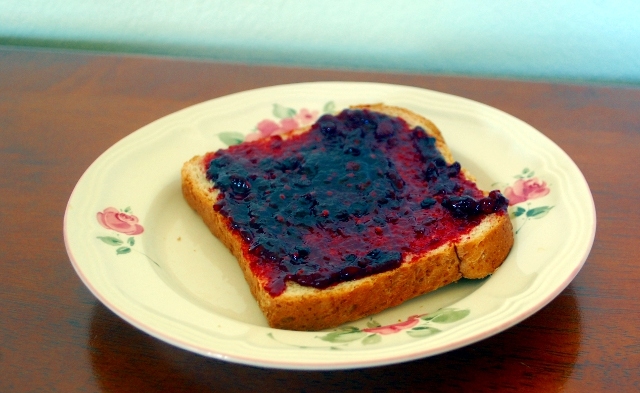 I’m eating bread and jam for breakfast. This entry was posted in Cooking, Recipes. I do it the olllld fashioned way! Making bread too. I can’t stand appliances. But one that does more than one thing–like make jam and bread can’t be that bad right? Personally I love preparing food the old-fashioned way. But having something I can just put ingredients in and turn on means that my kids have homemade bread and jam a lot more often. Plus, I can set the timer so bread finishes baking just as we get up in the morning, or get home from a day out. After making in bread machine can u then freeze the jam? Thanks for the recipe, can wait to try! Yes, I freeze my extra jam. It’s supposed to last for up to a year in the freezer, but I’ve never left it in that long!! After you finish and the jelly is in the jars, can you do the hot bath? I would like to not have to put the jelly in the freezer. I would imagine that you can, although I’m afraid I haven’t done hot canning since I was a teenager helping my mother, so I can’t comment on the food safety or anything like that…but it’s just a different way of cooking the jam, isn’t it? I would definitely try it if I knew how. I would like to have sugar free strawberry jam. Can I replace the 1 cup of sugar with 1 cup of Splenda instead? My Brother does his both sugar and sugar free (uses apple cider for sweetening) I like the sugar free best. However, make sure you get the correct pectin, there are different kinds for different processes. As for sealing jars they should seal if warm when hot liquid put inside and rims cleaned. You can use a hot water bath and I have done this as an experiment. However if the rim is not clean nothing will seal it. 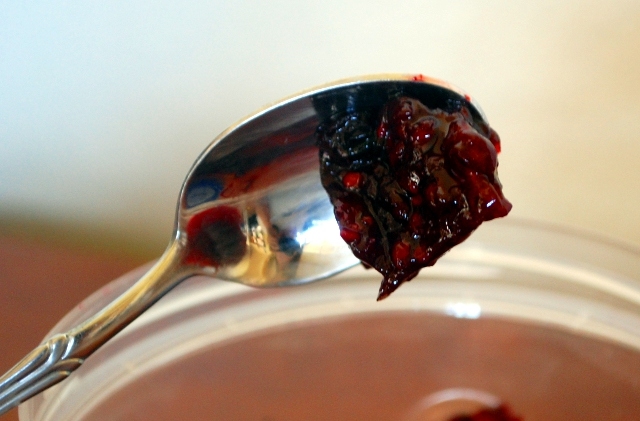 Made he blackberry jam – I made a double batch and added 1 cup sugar – 1/2 for single recipe. It came out perfect!!! Everyone loves it! Thanks! Now need to make blueberry. I have a quick question. After the jam cools in the bread maker pan, do you just pour it into tupperware-like containers and then either put those filled containers in the fridge or freezer? No special boiling/washing to those? That sounds so simple compared to making jam the old-fashioned way by having to boil jars and stuff! Obviously you have to make sure they’re clean, and if they’re brand new it’s best to give them a washing with dishsoap but yes. Pour it in, shut it, and freeze it! It works great if you have the freezer space. Made blueberry jam! Turned out great, thanks for the recipe!